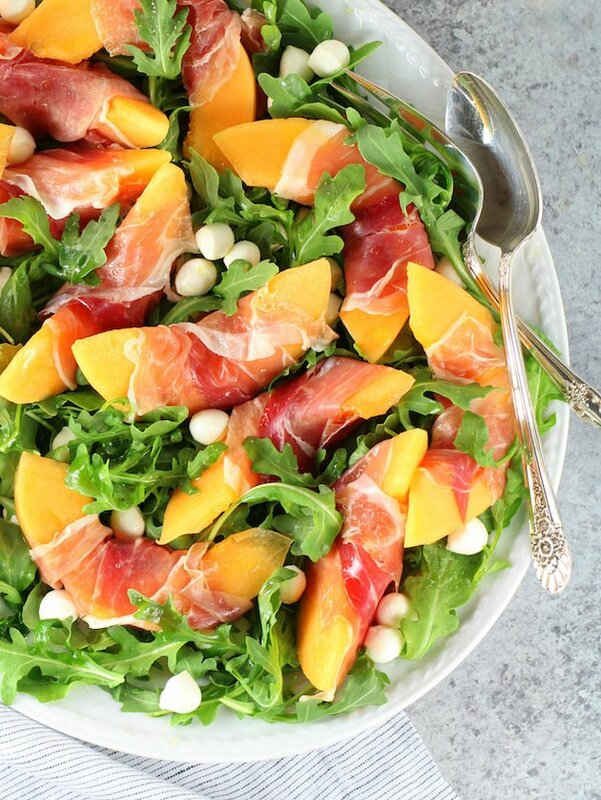 This Melon Mozzarella Prosciutto Salad with Arugula has stolen my heart!! It pairs classic Italian ingredients to create a sweet and savory take on the traditional caprese salad. It’s so simple and yet so delicious! Perfect for a healthy al fresco lunch or an easy light summer dinner. 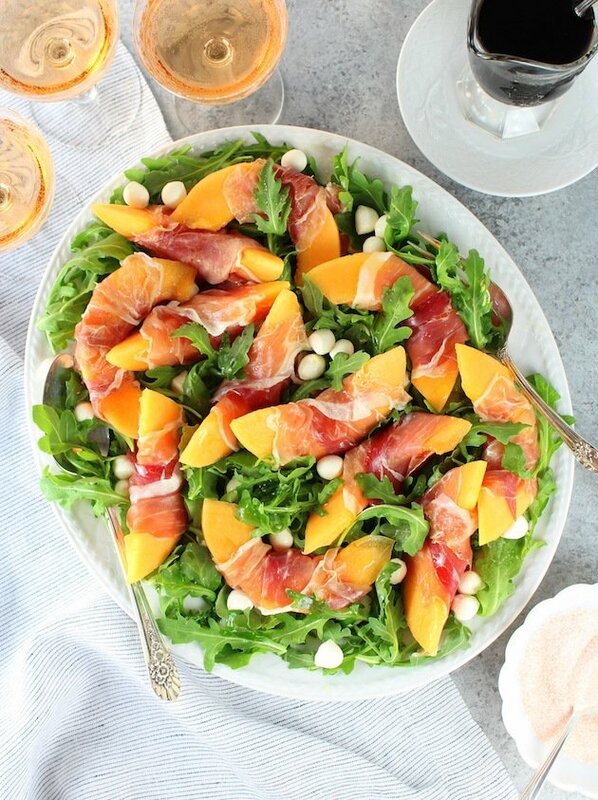 I’m so distracted by the gorgeous photos of this cantaloupe caprese arugula salad that I can hardly even focus enough to tell you about. Never fear, I will press on. There’s just something so amazing about a ripe cantaloupe. Ripe being the operable word. How many times have you purchased a cantaloupe only to bring it home, cut into it, and find that it’s flavorless and crunchy with zero sweetness? Ughhh. I think we’ve all been there – right?? Well, I’m here to help my friend! Because I want all of your food experiences to be amazing I’d like to share with you a foolproof process on how to tell if a cantaloupe is ripe. With cantaloupes there are 5 key indicators of ripeness: the stem end, the netting, the color, the touch, and the smell. Stem: The stem should not be left on the cantaloupe. If it’s still there, the melon is not mature and was probably picked too early. Check for tears in the rind around the stem, since this can also mean the melon was harvested prematurely. The stem end should be slightly indented, which means that the fruit came away from the vine easily. Lastly, make sure to avoid fruit with soft moist-looking areas around the indentation. Netting: The netting (or webbing) on the skin should be thick, coarse, and pretty well defined, and it should stand out more in some places than others. Color: The base skin color of a ripe cantaloupe should be tinted gold, not green. Touch: A good cantaloupe should feel relatively heavy for its size. Pick up several melons to compare to compare them. Also, the blossom end should yield just a bit when pressed. Smell – The melon should smell sweet. The best area of the fruit to smell for ripeness is the end opposite the stem area. Smell a few different ones and it will become apparent which one smells sweeter than the others. Use these tips and you’ll be sure to only enjoy the most delicious, sweet, ripe, cantaloupes every time! Oh, and in the name of passing on relevant and pertinent information I have another cantaloupe tip for you: What we normally call “cantaloupe” is really muskmelon. Yes – true story people. I’ve mentioned before we had a very large garden when I was a kid. Well, one of my most favorite things we grew was muskmelon. At least that’s what my mom called it. 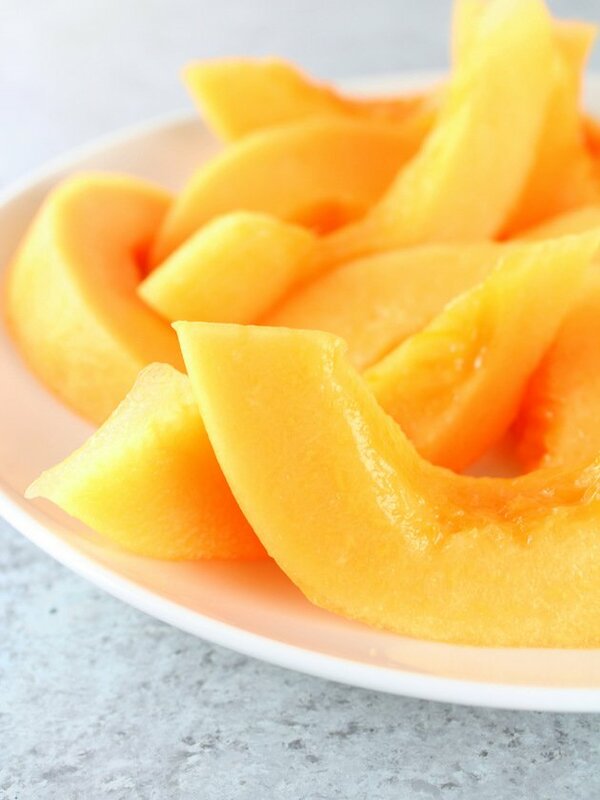 Many people and most grocery stores refer to the same melon as a cantaloupe. This had me wondering why this melon has two names. Is it cantaloupe or muskmelon?? The name muskmelon comes from the sweet fragrance of the ripe fruit. The term musk comes from a Persian word for perfume, and melon is a French word derived from the Latin melopepo, which means “apple-shaped melon.” Within the muskmelon species, there are many different types with a wide variety of shapes, sizes, flesh color and flavor. There’s actually no cooking required for this recipe – music to your ears, right!?? 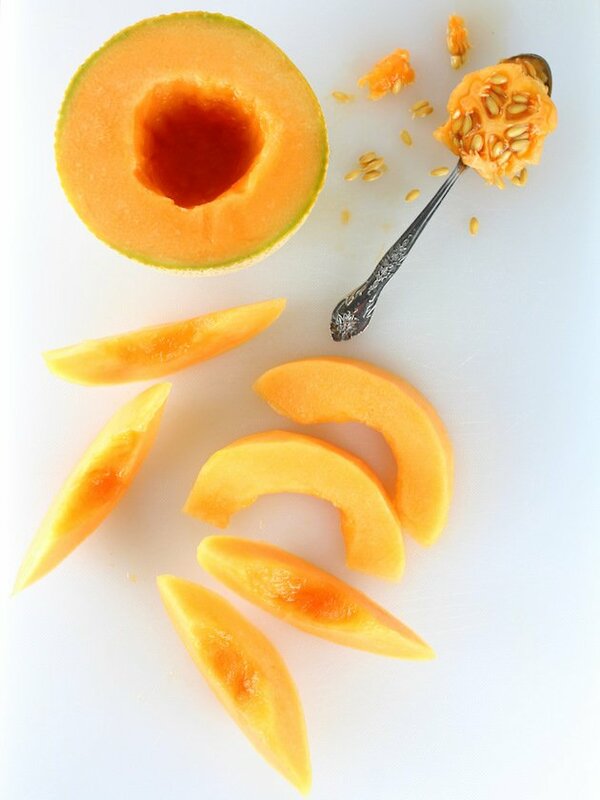 You start by cutting a small melon in half – stem end on one side and blossom end on the other. Scoop the seeds out with a spoon and throw them away. Now cut each half melon in half again – creating four quarters. Next, slice each quarter into 1-2 inch melon wedges. They should look like slivers of the moon. Using a small paring knife, cut away the skin/rind from each piece. I usually try to remove all of the green rind, only leaving the ripe blush-colored fruit (my melon produced 12 wedges). Now wrap each melon wedge with a slice of prosciutto di parma. I try to cover as much melon surface with the prosciutto meat as possible. Place your baby arugula on a large platter. Sprinkle on some of the extra small pearl-like mozzarella also known as Perlini. Then arrange your melon over that and finish with more mozzarella. Drizzle some extra virgin olive oil all around the salad, and sprinkle some salt on the melon pieces. I used Himalayan salt but sea salt or whatever you have on hand will work too. 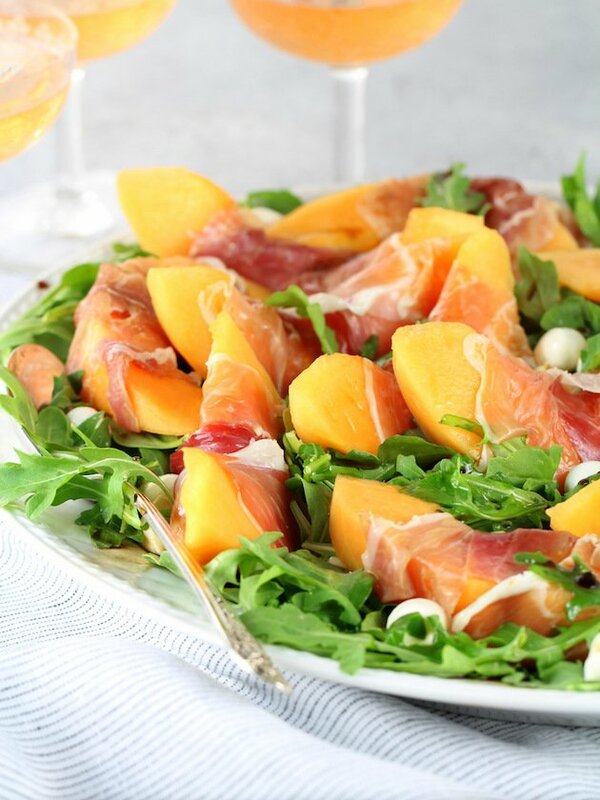 You can serve this delicious Melon Mozzarella Prosciutto Salad with some balsamic on the side. Personally, I like to eat mine “as is” without any vinegar. 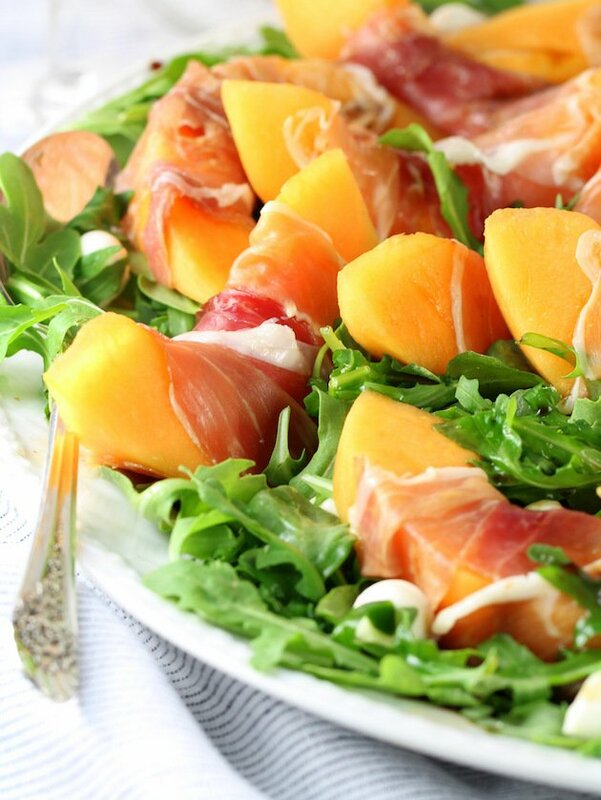 I just love how the savory prosciutto complements the sweet cantaloupe and how the arugula adds a little kick. 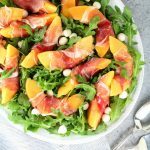 This yummy salad combines classic Italian ingredients with fresh melon to create the ultimate summer meal! It’s easy, so tasty and no oven or stove required! buon appetito! Sometimes I like to add avocado to give the salad even more creaminess. And because, well, avocado (big swoon). Red onion would add an additional crunchy bite and a little savory kick. Basil is always served with a traditional caprese salad and could add some nice herbaceous flavor to this one. If you wanted to make this salad even more filling, some quinoa would be a great addition. Plus, you would get the added benefit of extra protein. And speaking of protein, if you or someone you love has a high metabolism, some grilled chicken breast would be a delicious hearty accompaniment to this yummy summer salad. 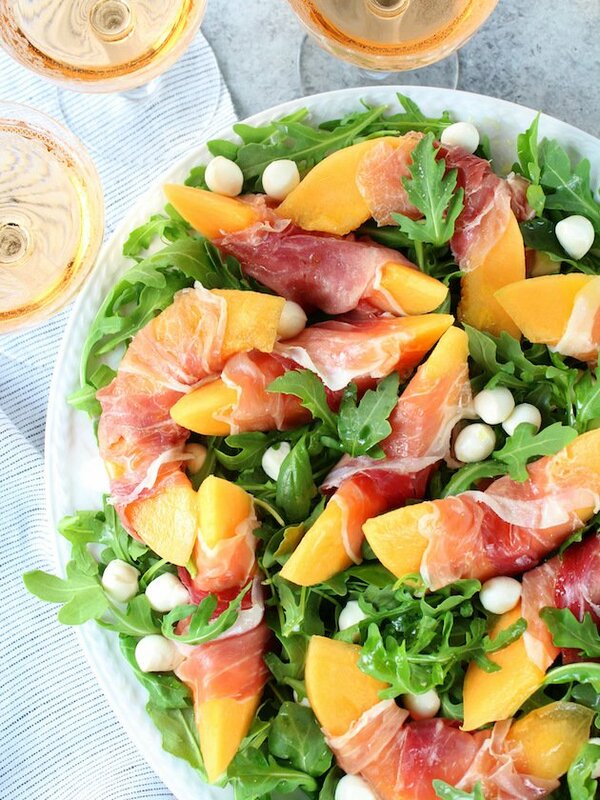 This Melon Mozzarella Prosciutto Salad pairs classic Italian ingredients to create a sweet and savory take on the traditional caprese salad. It’s so simple and yet so delicious! Perfect for a healthy al fresco lunch or an easy light summer dinner. Cut the melon in half, stem end on one side and blossom end on the other. Scoop the seeds out with a spoon and throw them away. Cut each half melon in half again – creating four quarters. Cut each quarter into three slices. Then using a small pairing knife cut away the rind from each slice. Remove all of the green rind, only leaving the ripe blush-colored fruit (my melon produced 12 wedges). 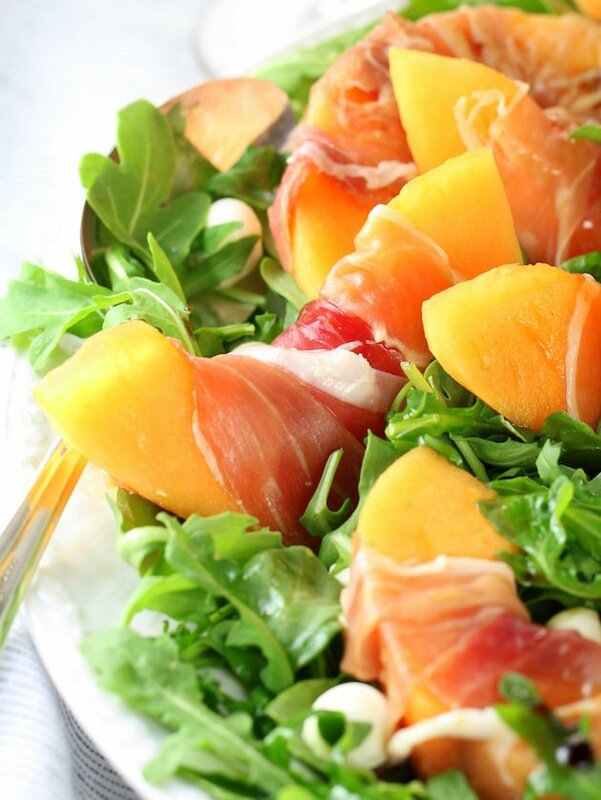 Wrap each melon wedge with a slice of prosciutto di parma. Cover as much melon surface with the prosciutto meat as possible. Place baby arugula on a large platter. 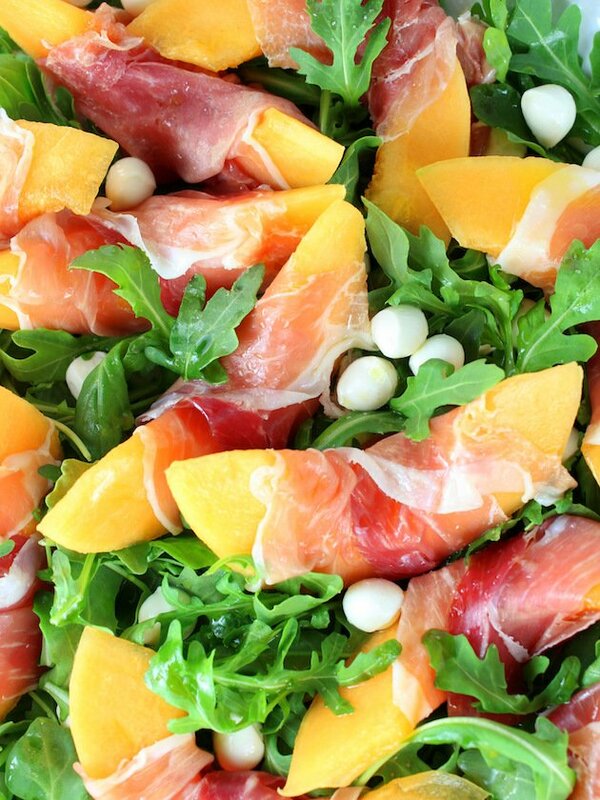 Sprinkle pearl mozzarella, then arrange melon on the bed of arugula, and finish with more mozzarella. Drizzle extra virgin olive oil all around the salad, and sprinkle salt on the melon pieces. If desired, serve with an aged balsamic vinegar. This is some serious salad deliciousness! What a great combo of flavors! Thanks, Kathryn! I love it when easy and delicious go hand in hand! What a great flavor combo! Takes me back to vacationing in Italy. Fresh, delicious real food! For sure, Erin! Thank you! It’s so effortless and delicious – I can’t get enough of this salad! This has stolen my heart as well. The salty sweetness paired with the bite from arugula is perfect.